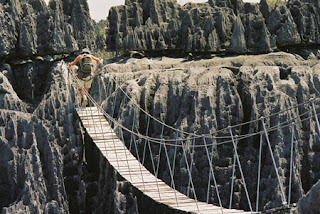 Tsingy unique tourist attractions in Africa. When called Madagascar, the first thing that comes to your mind might be about their wildlife. 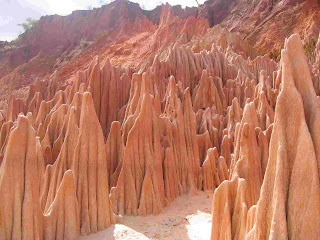 One of the pre-eminent place in Africa is the Tsingy de Bemaraha, a unique geographical area with attractive landscape shaped expanse of forest pointy rocks. Famous for other than landscape that can not be found anywhere else, Tsingy also known for its mangrove forests and animal populations are found in the region, the lemur, a type of white monkeys are increasingly jumping from rock to another rock. Tsingy officially as the Seven Wonders of Nature in Africa who receive special attention. There are about 100 species that exist in parts of the world are threatened with extinction. Wildlife, fauna and flora that exist in the Tsingy, adding to the variety of wildlife wonders of nature that seems so appealing. Unique natural phenomenon that makes the Tsingy as one of UNESCO world heritage.